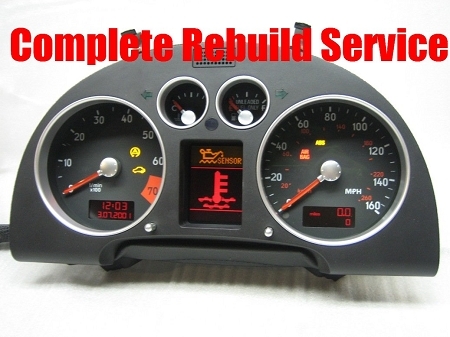 Most Complete Repair/REMAN Service for Audi MK1 TT instrument / gauge cluster. 2000-2006 Audi TT instrument cluster is prone to multiple failures. Failure level is mostly dependent on age and mileage of the car/instrument cluster. Failures include: pixelated and faded center LCD panel (also referred to as the driver information display), inaccurate (or non functioning) coolant temperature/fuel/speedometer and tachometer gauges, erratic behavior of indicators, flashing, flickering or disappearing clock and odometer display, as well as parasitic battery drain. Some of the mentioned problems are caused by component failure, while others by unstable microprocessor/software and micro-cracking of solder joints around components on the system board. 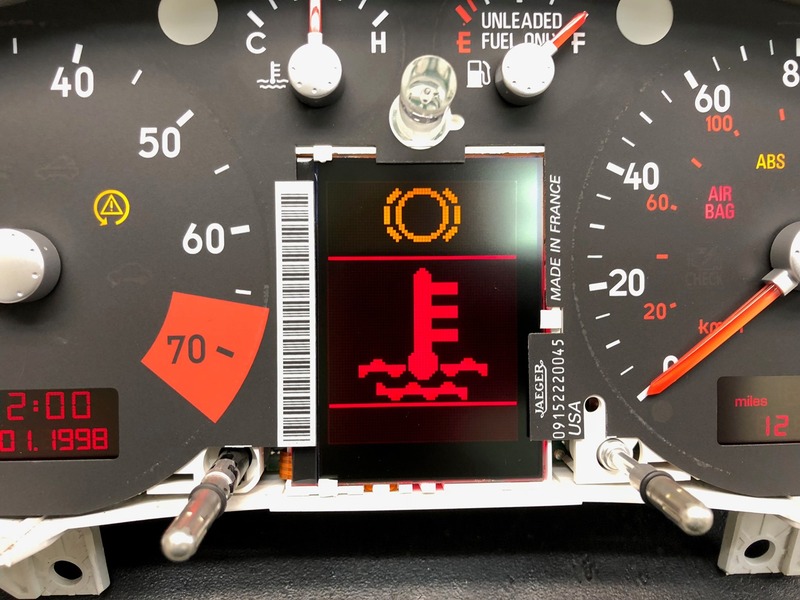 Software problems are most often experienced on early (2000-2002) model year instrument clusters, which included an early type of Motorola Microprocessor. The Microprocessor is prone to FLASH memory loss over time. Microprocessor/software problems most often appear during colder temperatures, but eventually progresses and become permanent. Our Complete Repair Service fully restores your failing/failed instrument cluster and addresses all commonly failing components. All models of MK1 Audi TT (2000-2006). Please note that the repair will not affect your immobilizer (if equipped) or odometer status. You will receive the exact item you shipped in for repair. Cluster will be plug and play and no coding/re coding is required by the owner. The immobilizer will be coded so that the car starts without any delay or lockout time. In some rare cases we may deem your instrument cluster non repairable or unstable. This can be a result of severely damaged system board, mainly due to age/mileage/condition/tampering or previous repair attempts. The condition is typically due to severe micro cracking of the system board. Best effort will be made to re flow/repair the system board components. If we deem the instrument cluster to be unstable and non repairable, you will be offered a replacement refurbished "donor" or new (if available) cluster option at an additional cost. We will notify you of the condition and seek approval to replace the system board or instrument cluster. If your instrument cluster is of a later model Audi TT (late 2001 + models), is also incorporates the immobilizer system brain. In these cases immobilizer identity cloning is required from existing cluster to new/donor unit, making the replacement unit plug and play. Repair process involves removal and shipping of your own instrument cluster for repair. The repair is typically processed within 10-21 business days (dependent on current work/repair backlog and complexity of repair), plus shipping/transit time. Excellent communication and service on the full rebuild. Even cleaned the glass inside the gauges. Will use again. Just purchased a 2001 Audi TT w/ several issues. Pertinent to this review - it had bad cluster behavior (stepper motors, LCD, random errors), a CEL (P0501 - vehicle speed sensor), and the cruise control didn't work. What was strange about the speed sensor fault was that the vehicle speed displayed correctly in the cluster, but the ECU was still throwing faults (it wasn't receiving signal properly). Tom did a great job making the cluster look brand new - he took the time to clean the glass while it was apart, and the brand new components / solder reflow / reflash made the cluster work GREAT. 110% satisfied with the work, you can tell he is very passionate and takes pride in his work. It turns out the CEL for the vehicle speed sensor was because the cluster wasn't properly communicating the signal to the ECU (speed sensor goes directly to cluster, where cluster retransmits to various modules). I don't know if this was due to the microprocessor failure or a bad solder joint, but regardless it works correctly now. With the working speed signal to the rest of the modules, my cruise control works again as well. THANK YOU!!!! We sent a Start Authorization module for an Audi A6 to be repaired. I found the owner to be very prompt and courteous and I would have absolutely no hesitation recommending this company to my friends and customers.